MANSFIELD — I met Eric Barnett shortly after starting work at the Galion Inquirer. He had just finished a long bike trip and I write a story about him and his journey. I was impressed by his spirit and his drive. The determination and grit it takes to ride hundreds of miles on a bike and live out of a backpack is something to be admired. While speaking with Eric, I learned he was a factory worker at General Mills, that he was married, that this bike trip was not his first and that he had plans to one day record and release a solo record. CD release party Friday at 8 p.m.: Barnett is having a CD release party tonight in Galion at 1803 Taproom on Harding Way East. The party starts at 8 p.m.
With General Mills being bought by another company, Eric was left with a choice. He could take his chances with the changes that new ownership brings or he could cash in his chips and retire. Barnett went with the second of the two choices. That new-found freedom allowed him to pursue the recording he desired. So, with the help of a Kickster campaign and fellow artists and musician friends, “Shipwreck in a Bottle” came to fruition. “If there’s stuff that you really want to get right, you’re almost afraid of starting it because you don’t want to get it wrong,” Barnett said at the listening party. He was referring to having to handle recording most of the instruments on the album, getting the right message across through the finished product and quite possibly, life in general. “If you’re into the arts or with writing, if you think there’s something there, if you think that it could be good … I had one shot. Once you’re done, you can’t have it back” he said. A perfectionist, Barnett had to trust his friends when they said it was ready. He sent off the contents of his flash drive to be pressed and made into what would become the 10-track album. “Shipwreck in a bottle” contains tracks that touch on the daily grind of third-shift factory work, a fellow musician, a friend lost to a motorcycle accident and the anchor that is Barnett’s wife, Andrea. Emotions overflowed Thursday night as Eric’s whiskey-tinged delivery seemed to put you in the basement where the tracks were recorded. The album was officially released Friday, June 23. 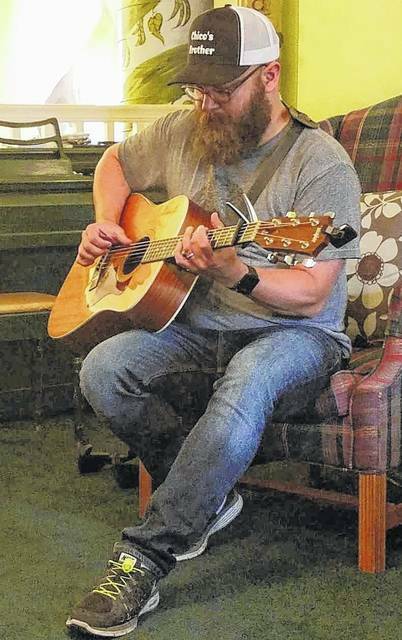 Chad Clinger | Galion Inquirer Singer/Songwriter Eric Barnett picks away at his guitar while performing a track off of his self-released album, “Shipwreck in a Bottle”. Main Street Books in Mansfield held the listening party for the album on Thursday June 22.
https://www.galioninquirer.com/wp-content/uploads/sites/38/2017/06/web1_Eric-Barnett-2.jpgChad Clinger | Galion Inquirer Singer/Songwriter Eric Barnett picks away at his guitar while performing a track off of his self-released album, “Shipwreck in a Bottle”. Main Street Books in Mansfield held the listening party for the album on Thursday June 22.